Ald. Melissa Wynne (3rd) speaks at a city meeting. 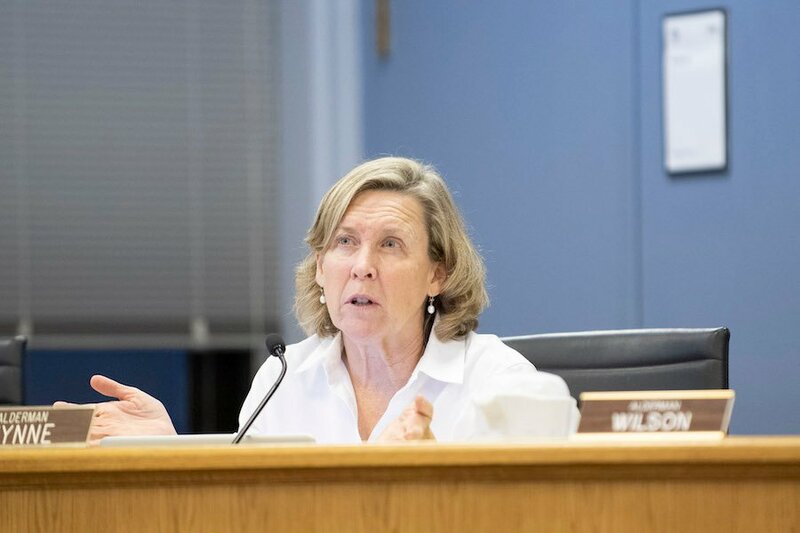 Aldermen on Monday approved Evanston’s operating budget for 2019. Aldermen voted 6-3 to approve the city’s 2019 operating budget at a Monday City Council meeting, granting the city more than $319 million for the next year. The budget’s approval comes after months of deliberation among aldermen. It is set to combat a deficit totaling $7.4 million, which will be filled through a combination of increased fees and taxes, as well as departmental restructuring. Earlier this year, residents were able to submit to the city what they considered the most important city programs and services in a priority-based budgeting initiative. Since then, and after the city released its first draft of the proposal in October, aldermen and residents have discussed proposed changes to city departments. Early budget drafts included proposed cuts to the city’s Mental Health Board, the Department of Health and Human Services and Evanston Fire Department Station 4, all of which were cut or modified to fit into the final draft. Aldermen on Monday discussed proposed cuts and restructuring to the Department of Health and Human Services. The proposed budget would have eliminated three Human Services Advocate positions — two of which are currently filled. To make up for the reductions, the budget proposed entering a contract with the Evanston YWCA to provide around-the-clock crisis response for domestic violence crimes. The victims’ advocate services were recently incorporated into the department and were previously administered by the Evanston Police Department. Ald. Ann Rainey (8th) said she was concerned that the department does not have the adequate resources to provide services for victims, and that the advocates should be managed by the police department. Evanston resident Lesley Williams said removing the two advocates from the police department and transferring them into health and human services “(has compromised) their ability to do their job.” She spoke of an incident where an advocate had to receive authorization to work with a victim, delaying the services she was able to provide. Williams expressed concern about moving the services even further from the city. “Moving this to the YWCA, an organization that is not even part of the City of Evanston, would remove that continuum to care even more than it’s already been removed,” Williams said. Ald. Melissa Wynne (3rd) said the YWCA is the expert in dealing with domestic violence issues and the city should use their expertise. She suggested Council move forward and revisit the victim advocates conversation in six months to figure out whether the service, in its current configuration, is working correctly, or what changes need to be made. Evonda Thomas-Smith, the director of the Health and Human Services Department, said her staff works “very closely” with the police on victim services and emphasized the department’s goal of making necessary changes. Several community members demonstrated their support for the service, giving aldermen a sense of urgency to decide on how to allocate funds to victims’ services in the next fiscal year. Elliot Zashin, who lives in the 9th Ward, said revenues from taxes like the real estate transfer tax should be allocated to reduce cuts in important social services like victims’ advocates. To him, this is what providing an “equity lens” to the city’s expenditures requires.